People are targeted across this country because of who they are and what they believe. Vicious intimidation and cybertrolling; vandalism and arson of houses of worship; assault or even murder on your own doorstep. Hate is proliferating and spiking, so how do we combat it? 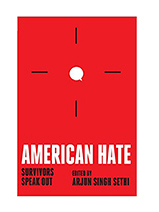 Arjun will take you to the front lines and show you how survivors are rebuilding and resisting, how local communities and allies are supporting them, and what you can do to take on bias and hate. Arjun met with immigrants and refugees weighing whether to stay in this country, people of faith trying to rebuild after their houses of worship were desecrated, and families mourning the loss of a loved one. But as he drove on unfamiliar roads in unfamiliar places, he also saw extraordinary examples of resilience and hope. The most vulnerable in this country are not retreating or abandoning hope. They are on the front lines combating hate, and coming together in neighborhoods, schools, workplaces, and houses of worship. Survivors are taking on white supremacists in court, engaging in difficult conversations with those who see the world differently from them, and working to ensure that every state has a hate crime law. The same is true for local communities and allies at large, who have repeatedly come to the aid of survivors. They’ve helped rebuild houses of worship, dedicated sites to honor those who have passed, and taken a public stand in support of diverse communities, making it clear that love is welcome in their town not hate. The stakes couldn’t be higher. By 2050, there will no racial or religious majority in the U.S, and these changing demographics will reshape our schools, cities, companies, and electorate. We must ensure that diversity reenergizes us, rather than divides us. 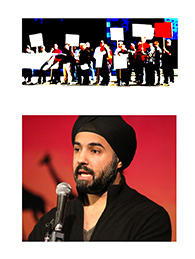 Arjun Singh Sethi is an internationally recognized human and civil rights lawyer, writer, activist, and professor. He has worked closely with communities targeted by hate, state violence, and surveillance for more than a decade. His essays have appeared in The Washington Post, The Guardian, The Los Angeles Times, USA Today, and CNN, and he is featured regularly on national radio and television. Arjun holds faculty appointments at Georgetown University Law Center and Vanderbilt University Law School and co-chairs the American Bar Association’s National Committee on Homeland Security, Terrorism, and Treatment of Enemy Combatants.